Nonsensible Shoes: Wednesday Warren Warning - A triple decker day. It's been about a month since I've updated some of the Elizabeth Warren news in the regular weekly feature as a result of the focus on the midterms. I thought I'd have some catch-up to do, but there's enough this week to actually bring three recent items to your attention. These three disparate items come together as a thread that is cause for concern, not because of Warren, but rather because of Hillary Clinton. First item: Liz goes to Israel. 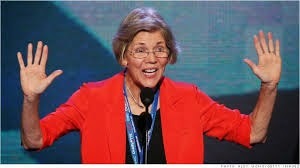 Elizabeth Warren’s trip to Israel and other Middle East countries is likely more an indication of the senator’s fast rise within the Democratic Party than a sign that she is rethinking her political future, longtime Democratic observers of the Massachusetts senator said Monday. Warren is the lone lawmaker on the trip organized by the State Department and the Senate Banking Committee, of which she is a member. This is a profile building trip pure and simple and it means at least some powerfully placed Democrats want her to be more visible either as the nominee or as the token opposition to Hillary Clinton. Getting her grassroots bona fides in place she tears into the Federal Reserve's William Dudley. Libertarian viewers might support Warren on this one, but consider the source. Warren is a purveyor of class warfare pure and simple. If you don't like the Federal Reserve, you still don't need an ally like Warren. She sees a more effective Fed as a more powerful tool to control the big banks. For her, a more effective Fed is a more powerful instrument. Third item: This one really scares me. Less than 48 hours after President Obama nominated Antonio F. Weiss, a longtime adviser on mergers at the investment bank Lazard and a Democratic supporter, to become the under secretary of Treasury for domestic finance, Senator Elizabeth Warren denounced the appointment and said that she would vote against his confirmation. “Enough is enough,” Senator Warren, a Massachusetts Democrat, declared. She said she was furious that the president would nominate someone from Wall Street. “It’s time for the Obama administration to loosen the hold that Wall Street banks have over economic policy-making,” she wrote on The Huffington Post . He has been a staunch supporter — and campaign donation bundler — for President Obama and is considered relatively progressive, especially by Wall Street standards. Oddly enough, Mr. Weiss is one of the few people within financial circles who might have been friends with Ms. Warren. Warren's outrage on this issue is a disqualifier for president, even the NYT defend the Tim Horton's Burger King deal as not particularly a tax inversion deal. This is simply anti-business. Her anti-business stance makes her un-electable, and Hillary Clinton that much more electable by comparison. That's really the scary part.